About one month ago, I managed to repair the engine temperature issue without spending a penny! Instead it required a dear amount of elbow grease removing and de-scaling all the cooling water pipes. Works like a charm now. On that day, I sailed to the east just past the River Roach entrance and then back west, past Essex Marina. I only used the genoa as I was single-handed and it was quite windy so I wanted easy sail control. I still haven't tested the furling mechanism on the mainsail. 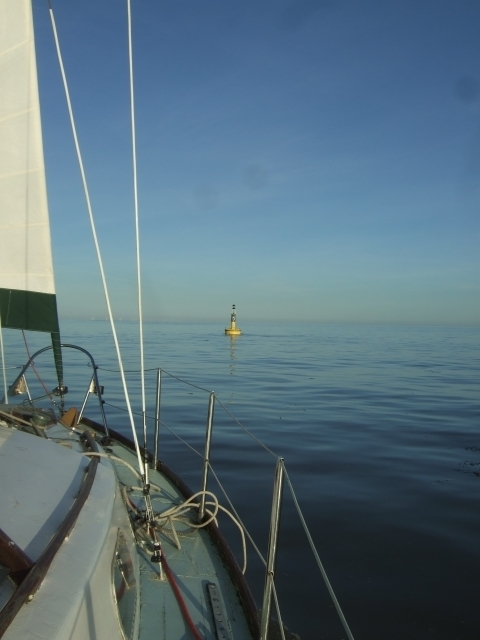 The past weekend we took advantage of the fine British weather (sunny, freezing & no wind) and motor-sailed from my mooring at Burnham-on-Crouch to the Crouch buoy, marking the entrance to River Crouch. A mere 5nm distance that took about 2 and half hours going against the tide. Of course, it was much faster on the way back taking about an hour or even less. The really annoying bit was having to motor all the way there and back, so still no proper sailing since I launched the boat. Nevertheless, going all the way to the Crouch buoy was a big step for me. It was the first time that Ting-a-Ling and I got a glimpse of the open sea, beyond the river. Straight ahead, in the distance we could see the wind-turbines of, what I believe to be the Gunfleet Sands offshore wind-farm. Visibility was very good on the day and I believe I could also see the London Array offshore wind-farm through my scope, to the south-east. Next on the agenda is to sail out of the Crouch, perhaps to the Whitaker Channel. To manage this in the few hours of daylight I'll have to start early, catch an ebb tide out and the flood back in. Problem is all those shallows just outside the Crouch. It will require some preparation and a good look-out. Tidal streams around the area seem to flow in the North-South direction rather than East-West which is the direction I'll be heading. In any case, I'll have to revise my day-skipper notes and think about planning. Just bought the Eastern Reeds Almanac which could help.